The cutting away of peat by hand methods on the perimeters, i.e. face banks of boglands has taken place for at least 200 years. 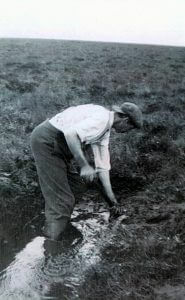 The Board’s survey established the present extent of high or virgin bog as distinct from the low or cutaway bog arising from the hand production. For peat production purposes the Board is interested in the high bog only. The Midland peat deposits were in general formed in lakes arising from glacial deposits which interrupted normal drainage. The bog floor rises to meet the upland. Hence the general term Basin Bog of the midlands. The floor or bottom of the peat deposit is extremely undulating. Apart from determining the extent of the high bog deposit the survey examines the peat types or the stratification to the bog floor. The degree of decomposition as expressed on an international scale of humification is determined. This scale ranges from H.1 to H.10 – the higher the number the greater degree of decomposition. The strata nearest the surface of a Midland bog are almost invariably of the younger sphagnum (moss) type. This is the only layer which may yield moss peat. It contains the remains of sphagnum mosses, hypnum moss, cotton grass and heather. The moss structure is generally clear. The humification ranges from H.1 to H.5. Beneath the younger sphagnum lies the older sphagnum characterised by a high degree of humification H.6 to H.10. Plant structure is sometimes difficult to establish. The material is of essentially the same structure as that of the younger sphagnum. The strata closest to the bog floor are generally formed of phragmites or reed peat composed of the remains of reeds, sedges, rushes, algae, etc., but very rarely of mosses and never cotton grass. It is generally of a high degree of decomposition H.7 to H.10. Whether admixed with the sphagnum layers as in sod peat or harvested as milled peat it is a very valuable material with drying characteristics much better than those of even the older sphagnum. Levels are taken at 100 yard intervals or closer along parallel section lines 250 yards apart on midland bogs and 100 yards apart on Blanket or Hill bog as in the west of the country. The depth of the bog at each level point is determined by a Swedish type tube borer coupled in lengths of one metre. The leading tube is provided with a special rotating head which enables a half metre sample from any particular depth to be carried to the surface. From the level, sounding and stratification data the profiles of the bog along the section lines are plotted giving the stratification detail to bog floor. The surface and bog floor contours are also plotted on tracings of the 6″ /mile maps of the bog areas. Midland virgin bogs vary in depth from 10′ to over 40′ – the bulk of the soundings lie in the range 15′ to 25′. Apart from the survey of the bog deposit the Board carries out detailed survey of all the minor streams and minor rivers carrying waters from the bog to main rivers. Peat is a natural deposit of decayed plant matter which has suffered varying degrees of decomposition. The average proportion of peat to water in midland virgin bogs is approximately 1 to 17, i.e. over 94% water. This figure varies from 96-97% near the surface to 90% at the bog floor. In drying from 96% to 30% (dried sod peat) peat loses over 94% of its weight, i.e. 100 lbs. of raw peat is reduced to less than 6 lbs. in weight. The final dried weight of 100 lbs. of 96% raw peat converted to briquettes at 12% is 4 1/2 lbs. Considerable care must be exercised in deepening bog drains, otherwise collapse of drains will result. The peat above water level in the drain wall dries slowly and shrinks. The moisture content (m.c.) m the drain side stabilises at some 90%. The specific gravity of all virgin peat only slightly exceeds that of water. Very approximately the specific gravity remains constant over the range 97% to 90% for peat in virgin volume. It follows that, in drying from 90+ X% m.c. to 90% m.c., peat in its natural state shrinks approximately 1OX%. Thus from 96% to 90% peat shrinks some 60%. Shrinkage of peat takes place slowly with drainage since the peat cell is reluctant to release moisture. In practice a new drain on bog land may be opened to a depth of some 4′ below the original surface in the first year of drainage. Thereafter the drain depth may be increased at the rate of 1′- 2′ of original bog depth per year, the deepening being dependent on bog quality. The drain wall meanwhile steadily shrinks vertically and a noticeable camber of surface develops towards the drain edge. The high bog area as revealed by the initial survey is studied in conjunction with the bog sections and the surface and floor contours to determine the best orientation for the bog trenches and for the collecting or cross outfalls within the high bog area to carry away the bog waters to the nearest stream or small river. The trench lines and cross outfalls are then set out preparatory to ploughing. The surveys of the minor rivers carrying the bog waters are studied to determine the practicality of gravity drainage for the peat deposit. The Board’s operations include extensive arterial works on these minor rivers. The total length of open drain on the Board’s 130,000 acres is approximately 17,000 miles. There is in addition a considerable length of mole drain. Drains are first opened by Cuthbertson plough pulled by the BNM tractor at a speed of 1/2 to 1 mile per hour. The drain depth at the plough stage is 20″ – the section trapezoidal with approximately 30″ top width and 12″ bottom width. Subsequently drains are deepened by special Board designed rotating disc machines at speeds of 200-600 yards per hour. These machines carry the depth to a maximum of 60″ with top width maximum of 60″ and bottom width approximately 12″. Subsequent deepening depends on the purpose of the drain and is achieved by the Board’s smaller type bucket excavators and peat cutting machinery, by drag lines specially tracked to the Board’s design, by the Hymac 580 specially altered for Board use, by Massey Ferguson 220 Digger, by the Steelfab (Wales) 800 Digger mounted on Ferguson tractor or by hand where it is desired that the drain shall conform to certain maximum dimensions. Special type screw pumps designed by the Board mounted on and powered by the BNM tractor clean slurry from drains to a depth of 60″ on milled peat bogs. Again a special chain saw machine to Board design is used for opening mole drains to a depth of 6′ or less as required. The Board has 66 matless draglines 10RB and 19RB of low bearing pressure which are very valuable tools for many bog operations including excavation in minor river channels and major bog drains. The specially adapted Hymac 580 is now increasing in use for many bog purposes. Levelling of bog surfaces is carried out by specially designed screw levellers of low bearing pressure at a rate of 1 acre per hour or greater dependent on requirements. Where major levelling of bog is required the BNM tractor is used with bulldozing or angle dozing equipment. Arterial drainage works are not always adequate for final drainage required to allow of working the peat deposit to bog floor. Pumping of whole bog areas or certain portions of bog areas arises where gravity drainage is impossible or achievable only at prohibitive cost. In these instances the pumps favoured are the Archimedean screw type or the Axial flow type electrically powered and electrode controlled. The screw pump is supplied by Messrs. Spaans of Holland and the Axial flow pump by Landustrie, Holland. The design figure of discharge for pumps is 1 1/2 cubic feet per minute per acre. In very severe rainfall run off is considerably ahead of the design figure but the bog drains have sufficient storage capacity to cope with all except the most extreme rainfall. In the past thirteen years a total of 129 pumps of the screw type with capacities of 2 to 20 metres cube per minute against lifts of 1 to 4 1/2 metres have been installed. In addition, there are 18 axial flow pumps generally of capacity 10-16 metres cube per minute. Where used these axial flow pumps are paired with screw pumps. The axial flow pump is controlled to switch in at a higher water level than the screw pump. Pumps now control the drainage of approximately 20,000 acres of the Board’s sod peat workings. The Board’s workings and particularly the milled peat workings require extensive use of concrete pipes. The use arises from the need to provide for very flexible and rapid movement across drains of the many machines involved. The pipes are manufactured by the Board in two strategic locations. The plants are by VIHY and Rimas of Denmark Pipes of diameters 6-9-12-18-24 and 36″ to one metre in length are manufactured to Class 1 strength which is adequate for nearly all the Board’s requirements. The length of pipe in use is close on 800 miles. The railway is the only means of peat transport on the bog and to the power stations, briquette factories, moss peat factories or tip-head for sale to the public. The gauge of the track used is 36″. The rail is in general of weight 30 or 35 lbs. per yard, mounted on steel sleepers 6′ in length and 2 1/2′ apart to which the rail is attached by steel clips. In certain positions, notably on lines external to the bogs, track of 45 to 60 lbs. per yard on creosoted pine or redwood sleepers is in use. The total length of track at present in use is some 550 miles, of which 400 miles constitutes permanent track. The remaining track is termed temporary track, i.e. it is lifted and laid up to 12 times in a year for transport of peat from piles. The length of a standard section of track is 30′ and the weight approx. 1200 lbs. complete. The section is lifted and laid by a BNM tractor with special lifting equipment or by a 10RB dragline. The standard turnout is also of length 30′ and is in two sections for ease of movement. It replaces a standard 30′ track length and is fitted in position on the permanent track in a matter of minutes. There are some 1,500 turnouts in use. Rail curves vary from 1,000′ to 100′ in radius dependent on their position in the track layout. Rail gradients are rarely greater than 1/150 but some gradients are unavoidably as low as 1/70. Rail bed construction on the bog surface depends primarily on good drainage. Rail drains are 24′-30′ apart for single lines, 50′ for double lines. The rail bed is formed of dry milled peat or of mould and sods placed in position by machine to a depth of 2′-3′ and well rolled. Subsequently the beds of permanent lines are ballasted, preferably with 9″ of sand or fine gravel. About 4,000,000 tons of peat is transported annually. Loading and unloading are entirely mechanical. The length of peat piles loaded in a year amounts to 1,500 miles. There are 60 bridges carrying County roads over the Board’s railways or carrying the railways over canals or rivers. The road bridges are of mass or reinforced concrete abutments (sometimes on timber piling) with reinforced or prestressed concrete decking. The river bridges are, in general, 40′-100′ in span with steel decking on reinforced concrete abutments or on timber piling. Some twenty bridges, similarly constructed, carry machinery across rivers. Exceptions to the above are two bridges crossing the Shannon. That at Lanesboro’ is of length 386′ with five main spans of 60′, end spans of 20′ and 35′ respectively and a navigation opening span of 31′. The piers are in reinforced concrete and the superstructure in steel. The bridge at Shannonbridge is of length 525′ with six main spans of 80′ and navigation span of 45′ giving a 42′ clear ope and over 13′ head room at maximum water level. The superstructure is in prestressed concrete with rails inset in the concrete. The navigation span is fixed. The river piers are over 40′ high and founded on rock nearly 12′ below bed level. Concrete used throughout is of a very high quality properly graded to give cube strength 7,000/10,000 lbs. per sq. inch at 28 days for a 1:1 1/2:3 mix. The Board operates 28 level crossings of County roads. The gates are of single leaf. Spans vary from 25′-40′. Light mesh is suspended from a hollow top boom of steel. Standard discs and warning lamps complete the gate. The layout of railways on the bog surface and, where necessary, in connecting bog areas separated by agricultural lands requires fair study and survey to determine the most practical arrangements. The minimum possible interference with upland is a prime consideration. Sites for power stations were decided in collaboration with engineers of the Electricity Supply Board as also were final details of rail layout and handling arrangements at the power stations. Capital drainage costs on the Board’s 130,000 acres amounted to slightly under £4,000,000; railway costs amounted to £4,300,000 of which approximately one-third was expended on all rolling equipment.